Although it takes an initial bit of effort, it will be thoroughly enjoyed by your family and friends…. Add the egg yolks and 35ml cold water and mix well. Gradually add the flour/cocoa powder until paste is formed. You can do this is a mixer or with electric egg beaters if prefer vs. by hand/spoon. Once done, wrap pastry in cling-film and leave it to rest (preferably in fridge) for at least 1 hour. Dust surface lightly with flour, and roll out the pastry until bigger than your tart ring/tin. Trim off excess. Leave to rest for 10minutes or more, to assist in minimizing shrinkage. Bake blind in oven at 180 degrees celsius for 20minutes. Baking blind, means you fit your tart with baking paper and put in baking beans or baking marbles. Lift out the beans and paper and bake for a further 5-10minutes, until base is fully baked. Make the filling in a double boiler or glass/metal mixing bowl over a saucepan of hot water. Put all the ingredients in and melt them all together until glossy thick and smooth. Pour into your cold, baked crust and let it refrigerate at least for 2 hours. Melt the sugar in a saucpean, gradually mixing until you have a golden liquid caramel. Pour in the pistachios and mix well, quikcly pouring onto a parchment paper/silicione sheet. 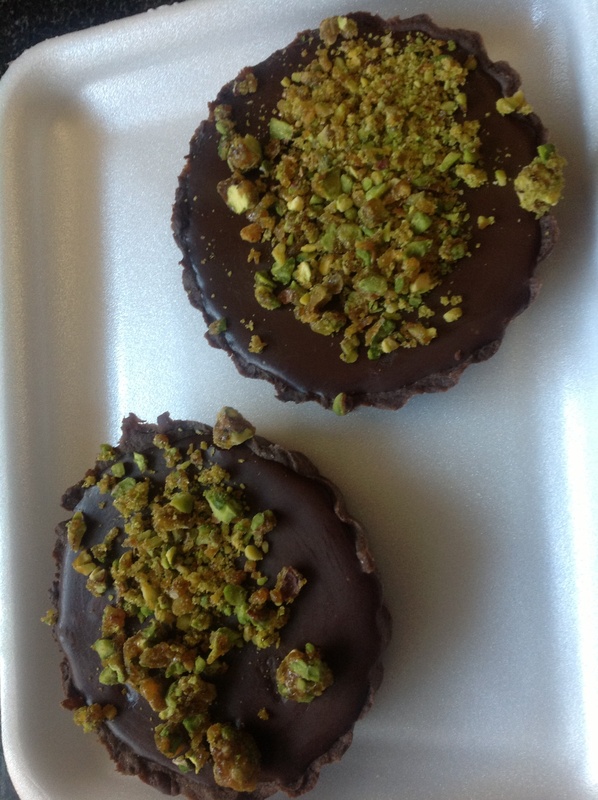 Allow to cool thoroughly, then break or chop (with mixer) into shards and sprinkle over the filling. 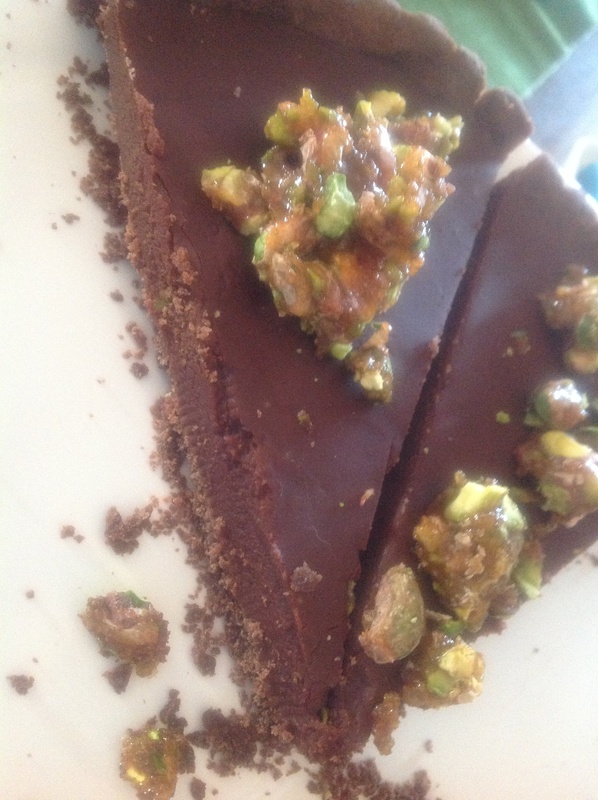 This entry was posted in Baking as easy as 1..2..3 and tagged brittle, Chocolate short crust, chocolate tart, dark chocolate, ganache, pistachio brittle by angelb38. Bookmark the permalink.